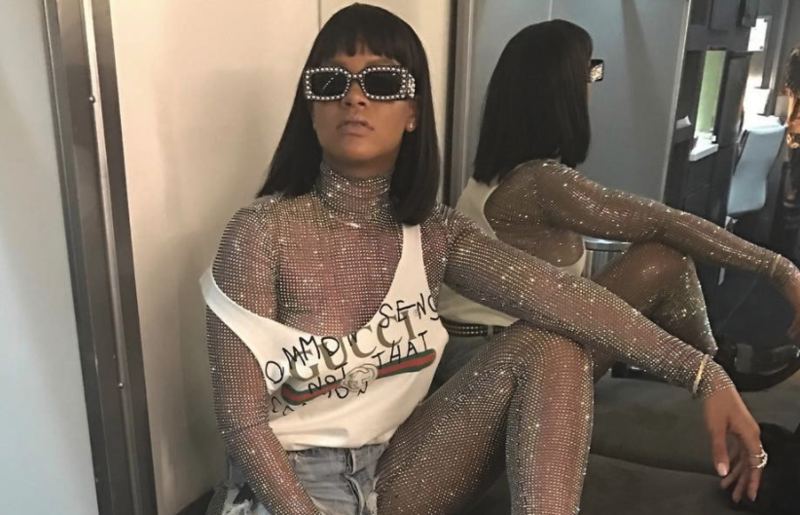 Rihanna has always been a fashion god and party animal. So it’d make sense that she would be at the world’s biggest music festival/ party scene over the weekend. I’m talking about Coachella. However, considering she is one of the most famous people in the world, it seems unlikely that she could have a chill time at Coachella without fans ruining it by coming up to her and harshing her vibe. Naturally, Rihanna has a fix for that. Morph suits. I don’t know how on earth she manages to look stylish as hell in a morph suit but she does. Maybe it’s because it’s a Gucci bedazzled morph suit? Maybe it’s also the bedazzled shades? I just don’t know. Oh, and if you’re trying to read her shirt, it says ‘Common sense is not that common’. Typical Rihanna that she’s slaying fashion and giving out good advice as well. Brace yourself for every person now captioning this to their Instagram photos for the next month or two. The morph suit is part of Gucci’s Autumn 2017 collection and the jewels on the suit aren’t fake ones, they’re diamonds. Someone took the time to put diamonds on a morph suit and then Rihanna saw it and the rest is history. What else would you expect of Rihanna? D A M N. Source. I’m glad Rihanna found a way that she can party in peace. It can’t be easy being one of the world’s most famous people and sometimes, you wanna let your hair down. Morph suits aren’t exactly the most traditional way to go about going incognito, but it makes sense that if people can’t see your face, they won’t know who you are. Good hustle Rih! People will definitely be stealing your idea though. Hopefully you have a new one for next year’s Coachella. Previous articleAre Orlando Bloom and Nina Dobrev dating?